When a person is using prescription drugs in a way that was not intended by the doctor that prescribed them, that person may be addicted to the drug. Addiction to a prescribed medication occurs when an individual’s brain is affected by the drug, causing a change in their behavior. They are no longer able to control their use of the prescribed medication regardless of the harm it causes. Prescription drugs are generally given to people that are suffering from illnesses, injuries, or after a surgery. Although they are legal when prescribed, addiction to the drug can still occur even if the medication is taken as prescribed. Some people like the feeling of euphoria, or high, they get when they take their prescribed medication and may take more of it than they are supposed to or take the drug more often. Others may borrow some prescription painkillers from a friend because they have a bad backache or other type of pain or injury and continue taking them after the original medical issue has resolved. Addiction to prescription drugs can happen quickly and is a growing problem in the United States. Although it is most common in younger people, it can happen to anyone regardless of their age, race, religion, gender, or occupation. 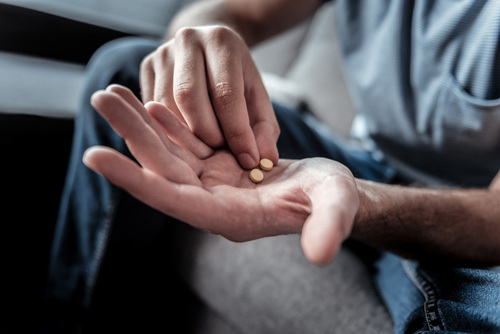 According to the National Institute on Drug Abuse (NIH), the three classes of prescribed medications that are most commonly abused are opioids, stimulants, and anti-anxiety medications and sedatives. Opioids are generally prescribed for the treatment of pain. Examples of these narcotic pain medications are Percocet and Oxycontin, which contain oxycodone, and Norco, which contains hydrocodone. Stimulants are often used to treat attention deficit hyperactivity disorder (ADHD) and narcolepsy. These drugs increase alertness, energy levels, and the ability to concentrate. Sometimes they are used as a study drug to increase academic performance. Like opioids, stimulants are very addictive. When used for non-medical reasons, they produce a euphoric, pleasant high. This class of drugs are central nervous system (CNS) depressants and cause drowsiness. Sedatives are usually prescribed as treatment for sleep disorders such as insomnia, and hypnotics are used to induce sleep. Tranquilizers are used to treat anxiety disorders, anxiousness, or to relieve muscle spasms. Benzodiazepines commonly prescribed include Valium (diazepam), Xanax (alprazolam), Ativan (zolpidem), Klonopin (clonazepam), and Halicon (triazolam). Non-benzodiazepines are sedative hypnotics that include Ambien (zolpidem), Lunesta (eszopiclone), and Sonata (zaleplon). Knowing the signs of prescription drug addiction can help to identify a problem early. Many people continue using the prescribed medication after the original issue has resolved. They may show no interest in other types of treatment options or get more medication by complaining about vague or phony symptoms. They may go doctor shopping, which is going to more than one doctor to get prescriptions. They often make frequent request for early refills or say their prescription was lost. There are also specific signs and symptoms of prescription drug abuse depending on the type of medication. If you or a loved one is addicted to prescription medication, there is help available. Call Canyon Vista Recovery Center in Mesa, Arizona, and speak to a professional staff member to learn about the treatment services available. Find out more about programs offered at Canyon Vista Recovery Center, drug treatment in Arizona.